The epic is coming to television. Esquire has just released a new preview of their upcoming adaptation of Beowulf. The series will premiere in January 2016. 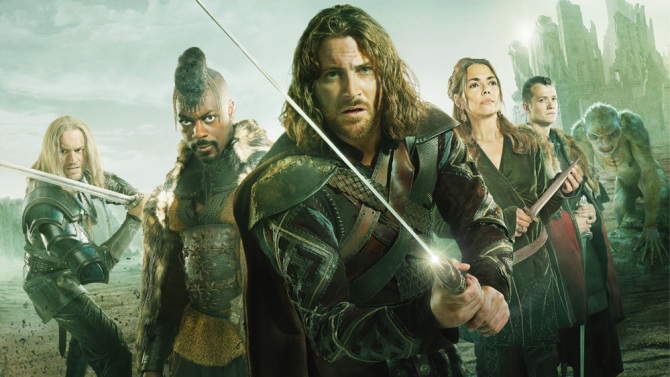 From writer James Dormer, the 13-episode series will follow the Old English legend about a hero who returns to his homeland and vows to save a neighboring mead hall from a monster named Grendel. The series will star Kieran Bew as the titular hero in addition to William Hurt, Joanne Whalley, and Downton Abbey‘s Ed Speleers. This will be the second scripted series ordered by Esquire, after the crime drama Spotless. What do you think? Have you read Beowulf? Would you watch the TV adaptation? I read Beowulf while in school. I’d be interested in seeing how the TV series handles the material. If Disappointed UK’s comments are any indicator, isn’t handled well. But I’ll judge for myself. If it isn’t at least as good as the story/effects in “Outlander,” it’s a nonstarter for me. Don’t bother with this people, it is truly awful. Monotone acting, dull script, terrible CGI, plastic sets, nice clean actors with blow dry modern hair styles. The politically correct casting covers every ethnicity (a female Asian blacksmith?!). It will be (should be) pulled after one season. Don’t suppose there’s any information on whether or not any Canadian channels might pick this up??? I’ve read “Beowulf”. When I was a boy, I read it in Middle English as a class project. I’ll watch this show & compare it with the story as I’ve read it. Go get’em, last of the Waegmundings!